Sometimes we speak of something as "the end of an era." Really important stuff, like, you know, when Monica moved out of Rachel's apartment on Friends -- that was "the end of an era." Or when the Cubs won the series, it was "the end of an era." But over the weekend the real end of a real era occurred because Chuck Berry, the Father of Rock 'n' Roll, passed away at the age of 90 on Saturday. You probably have seen (or at least heard about) the old Saturday Night Live skit where a bunch of psychics predict the first communication from aliens will be in response to those gold records scientists attached to the Voyager 1 & 2 space probes, which included a recording of 'Johnny B. Goode.' (Oddly enough I couldn't find a video of that skit on YouTube, but here's a transcript). That's how epic Chuck Berry was. We sent him into space to represent our people to alien races. 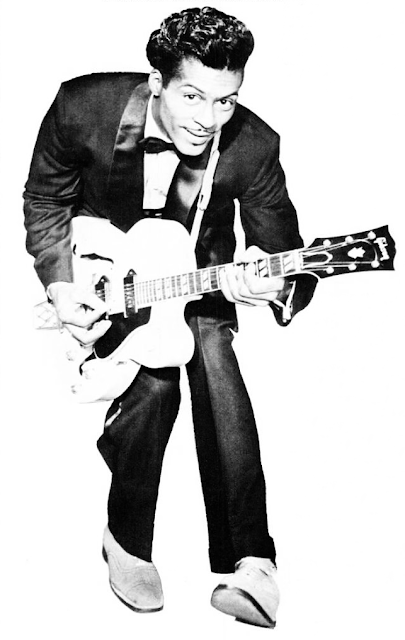 "The rock ‘n’ roll pioneer who established the form and the themes of the music with his slyly funny, rhythmically propulsive ’50s hits, such as 'Maybellene, 'Roll Over Beethoven' and 'Johnny B. Goode.' Berry hammered out the then-nascent sound’s groundwork in a series of self-penned singles... that successfully crossed over into the pop mainstream." You like yer modern music, ya' young whippersnapper? Well here's who to thank (well, him, Elvis, Little Richard, and Jerry Lee Lewis)!